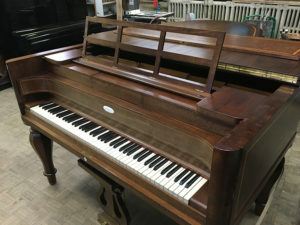 This 86 year-old beauty is an awesome example of both the craftsmanship of the old New York Steinway factory, and the brilliance of German mechanical engineering. 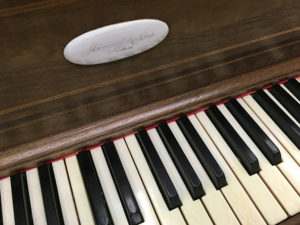 It is a player piano. A pneumatic marvel that translates a roll of paper, punched out with tiny holes, into music. It truly has to be seen to be truly appreciated. Hidden inside the case are yards of rubber and lead tubing, many square feet of rubber-coated cotton cloth and hundreds of hand-made moving parts. 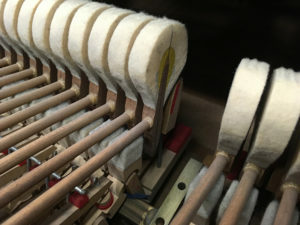 The player mechanism was built by Welte-Mignon in Freiburg, Germany. The owner has asked us to preserve the player system, but not restore it. There are few of this type left in the world, and fewer as time goes by. Rebuilding player systems is expensive, however, and the owner, understandably, hopes to leave this for someone to undertake in the future. 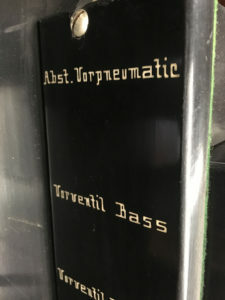 Its case design is unusual. Six fairly dainty pedestal legs support a boxy cabinet with mahogany veneer and bamboo inlay. 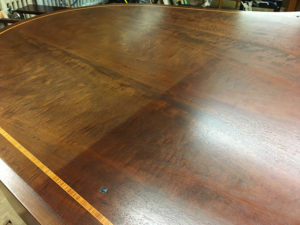 It has been refinished fairly recently. 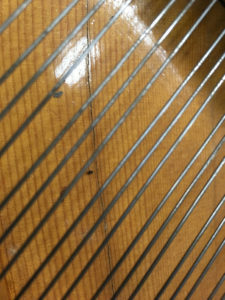 Although the refinisher did a decent job, the finish has bleached in the sun, leaving the variegated effect seen above. 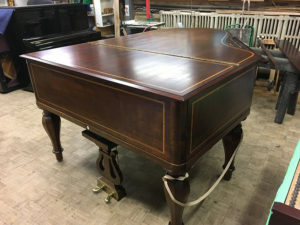 Someone who believed himself to be a piano rebuilder has also worked on it. Unfortunately, this belief seems unfounded, for he made many mistakes. 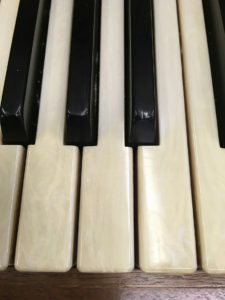 The original ivory keys were replaced using a poor quality “simulated ivory”, which was also glued on incorrectly – they pop off with very little effort. 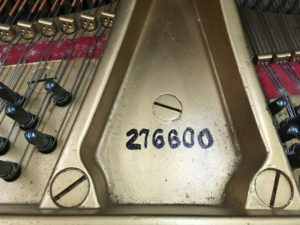 The plate has been painted using a spray can, and the serial number drawn on by hand. The soundboard has a few cracks, not major, yet unaddressed. It has (mostly) all the original action parts – including these ancient and rather decrepit dampers. 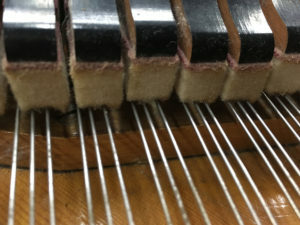 The original pinblock under the plate is in pieces, and does not hold the tension of the strings. The previous “technician” tried to repin it using the largest pin size available, which, of course, failed. It was also restrung improperly – with the tangs of the strings extending past the pin, and the becket (bend) of the string improperly bent. 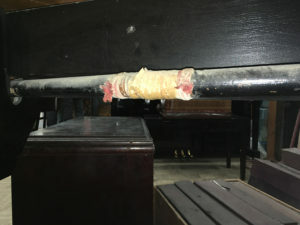 Judging by the type and wear of these non-Steinway hammers, they were replaced many decades ago, and show quite a lot of wear. 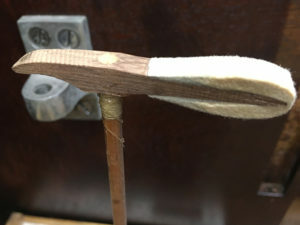 The top treble hammer had snapped off (probably the result of someone being incautious during action removal) and glued back on with thread soaked in glue – a typical “quick-fix” repair. The player mechanism, luckily, is fully intact but not operational. In the picture above you can see where someone has tried (many years ago) to stop an air leak using a glue-soaked rag wrapped in clear packing tape. The repair probably worked, but looks horrendous. 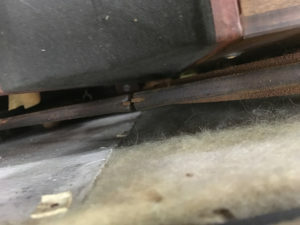 Beneath the “repaired” tube you can see the blower box (actually a vacuum pump), and boxes of original piano rolls. 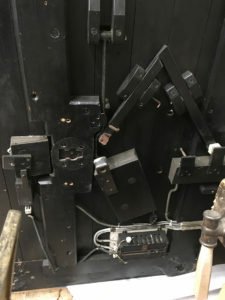 Inside the blower box, the caps holding the springs for the brushes of the original motor have let go. 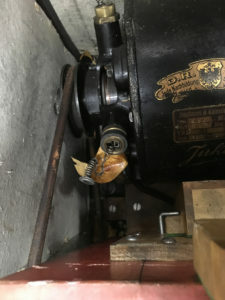 The original leather pulley is still whole. In the picture you can see where the two ends of the pulley have been sewn together. 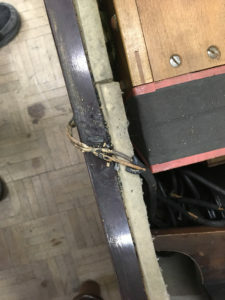 The original insulation of all of the wiring is crumbling. 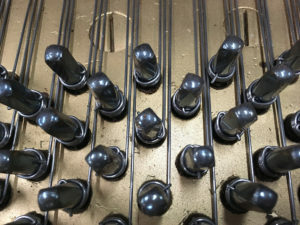 The pneumatic trapwork (the pedal action) is in fairly good condition – including the ancient rheostat. 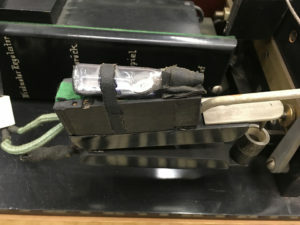 The mercury reed switch is still intact and working. This activates the “re-roll” of the paper once the piece has finished, and turns off the pump.